What bookworm doesn’t love bookish merchandise? I have a number of book t-shirts, socks, and of course tote bags in my closet and I am always on the hunt for cute little bookish gifts as well as more to add to my collection. While Out of Print tends to dominate the bookish merch market, here is why you should be looking at smaller companies that offer a quality product and original designs for bookworms—–personal touch. 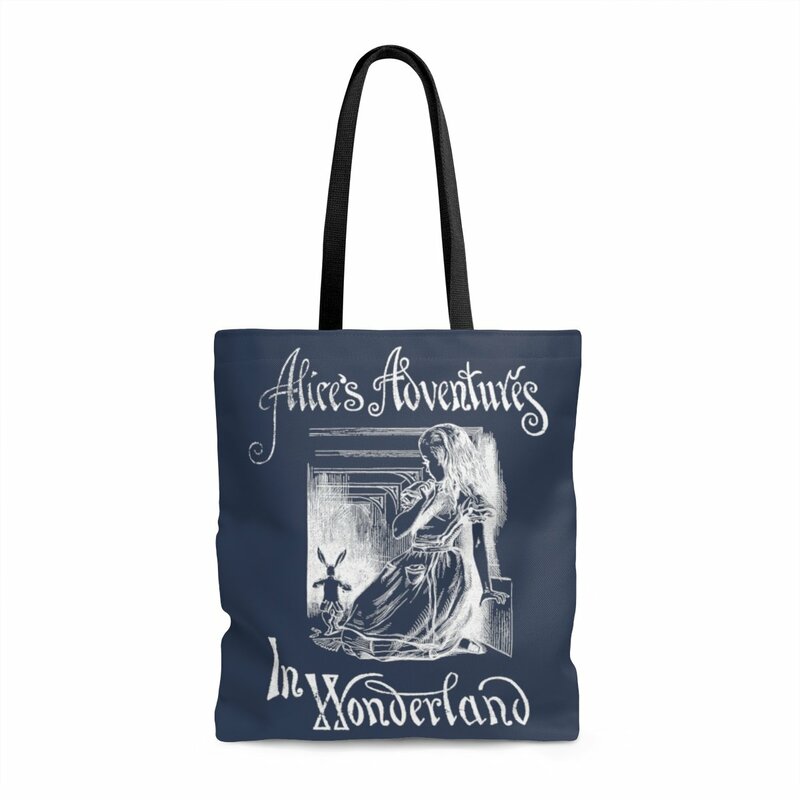 I recently discovered the company, Literary Book Gifts and they have a large selection of t-shirts (men and women styles) as well as a variety of colorful tote bags in a range of sizes. I recently ordered a women’s t-shirt and canvas tote bag to gage the quality for myself and I was impressed by the quality of both as well as the variety of colors and styles available. 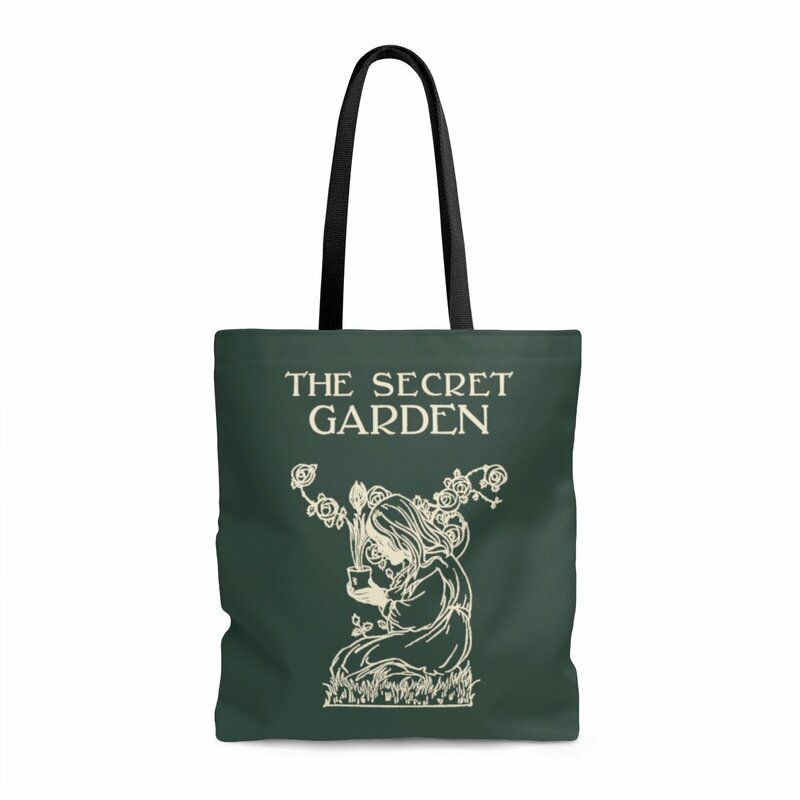 I ordered the medium size tote and it was a perfect size and the canvas was heavy duty and I have since received multiple about it when I am out and about. The womens t-shirt do run small so I would recommend sizing 1 or 2 sizes up for comfort. One of the things that I love most about this store, is the attention to design details. Many book merch companies just put the cover design on the their products but this store showcases unique designs from our favorite books. Often larger companies only feature a few of the more common classics for their merchandise, but this company has many of your favorite classics as well as a few obscure ones—Darwin I am looking at you. Take The Picture of Dorian Gray for example. This design focuses on the vanity of the painting and Dorian himself. 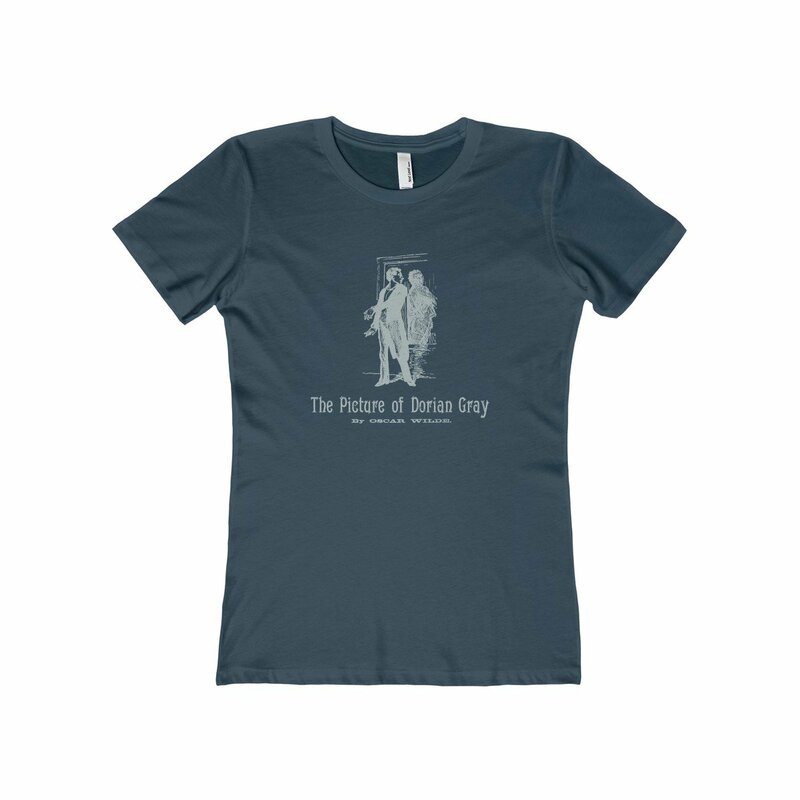 Rather than just putting a cover art on this t-shirt, Literary Book Gifts gets to the heart of the story itself. I also think it’s important to have choices. As you will see, the owner gives a fabulous write up about her company below, but one thing that hit home for me was the choices of this store. There are a number of different colors and books to pick from. There are a number of favorite classics and all styled with elegance and simplicity, and yet consumers can customize their choice by picking a color. 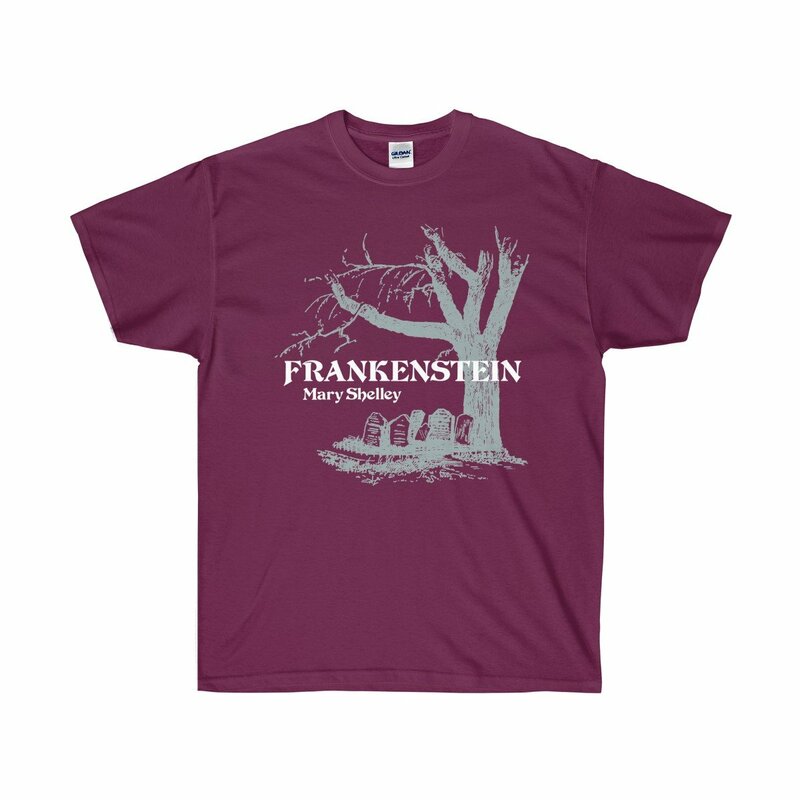 The Frankenstein shirt, shown here in red/maroon, is eye catching and captures a classic horror feel. But if you wanted something a little darker you might pick a black or charcoal. There are so many books to choose from in this store. They have everything from classic children books like The Secret Garden and Black Beauty to adult classics like Jane Eyre and Pride and Prejudice and then of course other darker classics like Poe and Dracula. They even have other designs that feature things like National Parks and Michelangelo. You might be curious which design is my favorite…..while I had multiples that stood out, the Ulysses design was my favorite. The simple bow was eye catching and classy and I loved the vertical placement of the letters. These designs are ones that I feel like I could incorporate into my regular wardrobe and not feel like I was being overly nerdy, if that makes sense. They are elegant and simplistic which I think makes them a classic design. Sometimes other companies use too many colors and the shirts get too busy but with this company the focus is on the simplicity of the design and show casing the spirit of the book. 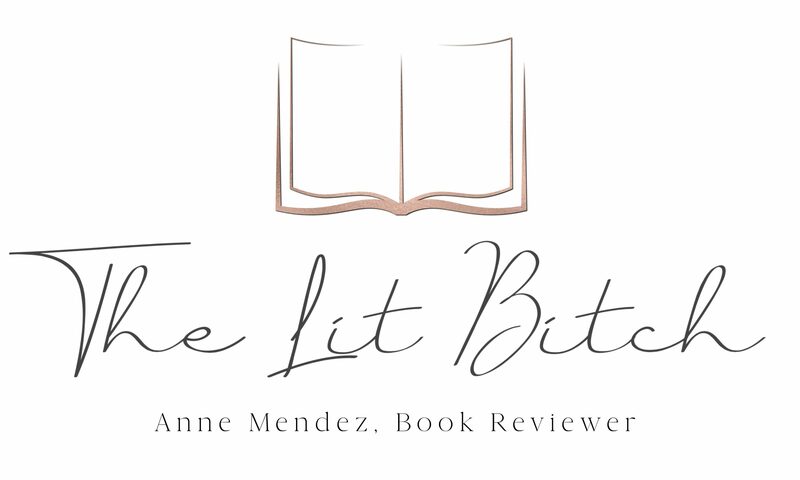 This is a small company just getting its start and as we get into the holiday season and you are shopping for your bookish friends…..or maybe even shopping for yourself, this is one store that isn’t to be missed. 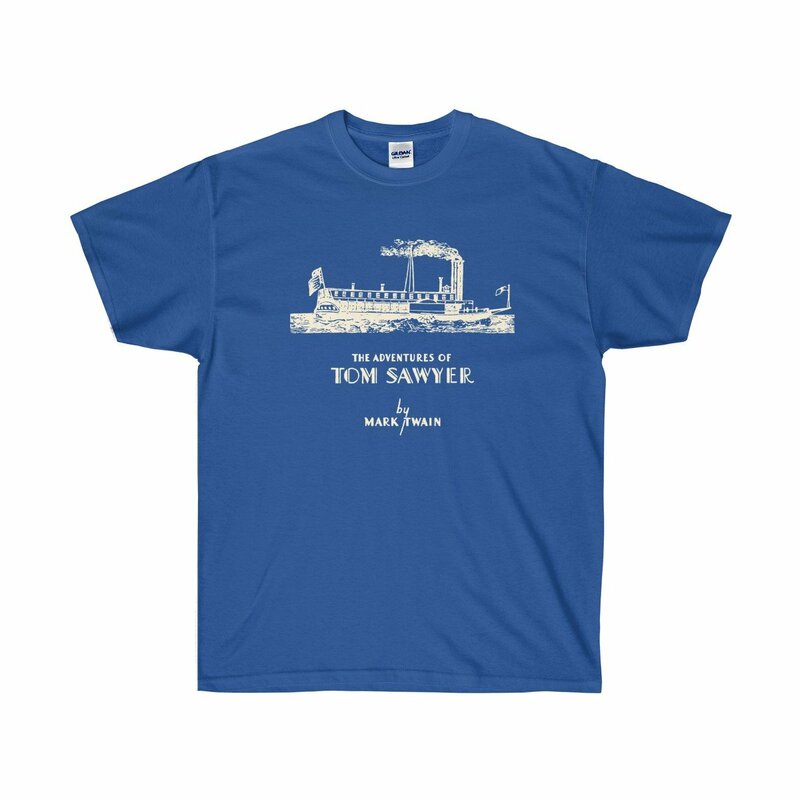 I found them reasonably priced with fast shipping and a quality product that boasted soft t-shirts and sturdy tote bags. Their website if easy to navigate and like the product designs—-the website is simple and customers will easily find their way around and products that they will love. I am thrilled to be able to also offer you all a discount with their store! If you are doing your shopping, be sure to use THELITBITCH20 for a 20% off! I can’t say enough great things about this company and I highly recommend you take a few minutes to peruse their website! I began Literary Book Gifts earlier this year, with the store launching to the world wide web just a few months ago. Like many others, I have a great love of books, literature, and other forms of writing such as poetry. What I noticed though, was that the taste of readers was as diverse as the many books available. For example, those interested in Frankenstein may also like The Picture of Dorian Gray but may not be interested titles such as Black Beauty or The Secret Garden. Essentially we all have different tastes. And I thought what better way to service such a variety of likes and dislikes than through an online store. In addition, there are tons of sizes and colors to suit each and every reader or writer. I am deeply inspired by the books I’ve read and the ideas that come from them. The classics give us representations of author’s worlds from so long ago. Fantastic and magical stories and characters we can only know through literature. And 100 lives we’ve never lived. I’ve gone on adventures with Tom Sawyer and down the rabbit hole with Alice in her Wonderland adventures. Literature is meant to be discussed and shared. Whether you are reading paperbacks, eBooks, listening to audio books, or wearing books on t-shirts, I encourage everyone to talk about the ideas and pass on their favorite reads to others! There is nothing like drinking a cup of warm tea while curling up with your favorite book in front of the fire. Especially in the winter time. Adagio Teas is a unique line of teas that does a number of literary inspired tea blends and pairings. Now I am far from a tea connoisseur but I know that I like chai, black, and orange teas so surely I would be able to find something that I liked on their website. I was blown away with how many different fan blends they have for book lovers! There are literally over 100,000 blends! This is mostly a site where readers and fans can create their own blends which I love because it allows the fan to create something special an unique. You can make your own blend with ease as well as find adorable art (or create/upload your own) to go with whatever book you are reading! It’s truly a wonderfully unique way to get involved with your book and share your love with other readers and tea lovers. Now you can find out more about each tea blend and what they contain as far as flavors and teas by clicking on each link above. I spent about a month showcasing, reviewing, and pairing my tea samples on my Instagram page which was a super fun way to interact with my readers and followers. I got to meet lots of new people and book lovers in a way that I hadn’t thought of before. So be sure to head over to my Instagram page and follow along. Anyway, the teas arrived super fast and in small little sample tins. The samples were inexpensive and made about 5 cups depending on how strong you like your tea. Fast shipping as well so I didn’t have to wait weeks for it to arrive. The teas smelled super fresh and the samples were in tins so nothing leaked out in the box. The first one I busted into was the Jon Snow blend. I was really impressed with the balance of the blend. The person who created this one had a vision and it was spot on. It had a little hint of ginger for edge and a kick, but the other ingredients balanced it out making it smooth and memorable. I won’t go into detail about every single tea I tried because that would take pages. But I feel confident that I leaned a lot about teas in this experiment. There are literally hundreds of blends you can try or create your own. The website is easy to navigate and the teas have a gourmet feel for a fraction of the price. And seriously who can resist a tin with your favorite book character or title on it? This is such a fun company and I highly encourage anyone who loves tea and books to try them out. Or send a few samples to your relative for holiday gifts! I know I am wording a bunch as stocking stuffers for all my bookish friends and family members! Get ready for a walk down memory lane readers. Nostalgia warning….. This year I decided on a whim to participate in Dewey’s 24 hour Readathon. I feel like every single year I miss this event and that just makes me sad so this year I decided it was now or never. At the urging of some of my bookish friends, I did sign up. So far I am 10 hours in and I’ve finished one book and am almost done with another. I hope to finish 3 books but would be happy with 2. I am documenting my pursuits on Instagram and on Twitter so please follow along. What is the purpose of this post you ask? Well every hour or so, Dewey’s hosts mini challenges which I have actively been participating in throughout the day on my Twitter and Instagram. This hour is about 10 years, 10 books where we are asked to post our favorite books published during every year the Dewey’s Readathon has been happening. I decided that a post on Twitter or other social media was rather overwhelming so I thought I would post a singular list here. Special Feature: Interactive Quiz–A Guide to Literary Britain! 2016 is going to be a big year for book to movie adaptations! And with the amount of big screen adaptions taking place this year, we were wondering if you can tell your Brontë from your Blyton, your Amis from your Austen? Travelzoo have cherry-picked 11 of the finest, most evocative entries in the canon of British literature for their interactive quiz – Guide to Literary Britain – featuring authors such as Winston Graham, Muriel Spark, Dylan Thomas, C.S. Lewis, Thomas Hardy and many more! All you’ve got to do is match the tale to the right city or region. For more information on each of the locations including what to see & do, top tips and interesting facts, please see here. This is a super fun interactive game/quiz that you can play over and over again! Be sure to check it out today!